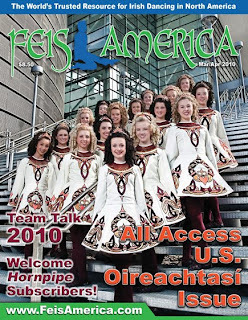 "Feis America is the only family magazine for Irish dance enthusiasts in North America and beyond. The focus of the magazine is family, positive self image, health and the multi-generational bonds that unite us through our passion for Irish dance and culture. Littlies to grandparents will enjoy the rich editorial and adventures in every issue. A reasonably priced magazine that transcends time zones and region boundaries is a small way to feel a big connection!" The folks at Feis America Magazine are thinking of releasing issues in a PDF format along with the hardcopy of the bi-monthly magazine. The Irish dance magazine recently acquired Hornpipe Magazine, formally published by Bartleby Press out of Austin, Texas, since 1999. According to the magazine's blog, international customers can order an online version of the North America-based magazine for a fee of $5.00. If you live outside of North America, you can start brandishing your swords: now you can subscribe to North America's premier magazine for Irish dance enthusiasts. To try out the PDF version of the magazine, follow Feis America on twitter, or facebook, then send a note to efeisamerica@gmail.com and you will soon receive a link for a free copy of one of their issues. This article first appeared in the Mar/Apr 2010 issue of Feis America Magazine. You might be tempted to think that the challenges of Irish dancing as an adult outweigh any benefits. After all, adults may have a harder time scheduling lessons, learning steps, dealing with stage fright, and getting their feet to do what their brains want. But where the body is weak, the spirit is determined. Adults all over the worlare taking on the challenges and reaping the benefits of Irish dance. 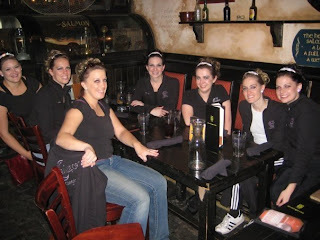 The women in the Crawford School of Irish Dance’s eight-hand team come from different parts of the country, have varied family demographics and may disagree on where to eat for girls’ night out, but they share a common bond: a love of Irish dance, discovered later in life. 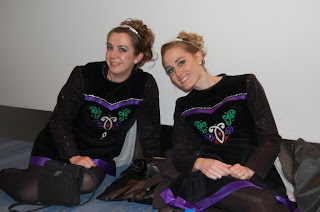 It’s plain to see that the Utah team members are familiar with the struggles of adult Irish dancing, but also recognize the rewards that come with it. The pressure of performing together as a team can be challenging for adult dancers, who often have to balance their dance family with work and family at home. Training for the 2009 Western Regional Oireachtas, the Crawford team found themselves juggling additional practices with their already busy schedules. “Balancing it is all about creating boundaries for yourself and allowing time for other things in your life,” says Hillary. No matter how much they sacrifice for their dancing, adults often find themselves battling with negativity towards their pursuit of a hobby in later years. “People don’t take us as seriously because we are adults. I wish we would get more recognition,” Alyson says. Adults are finding hidden treasures in Irish dance. They are gaining new skills, boosting their exercise, and discovering lasting friendships. As they worked towards the Oireachtas, the team learned that physical fitness is a bonus that results from their Irish dancing. The women on the team are already active. Maggie Hawley, for instance, goes hiking and to the gym, and uses Wii Fit to stay in shape. Other team members run marathons, train for sprints and participate in other forms of dance. Not only does Irish dance improve stamina, it can help tone unused core muscles and provide an aerobic workout. The eight women expected to gain a new skill and increase their activity, but what they didn’t count on were the added benefits of lasting friendships and a rip-roaring good time. “In my family, I am the only girl with three brothers. Being on this team makes me feel like I'm dancing alongside seven sisters. I love it,” Hillary says. 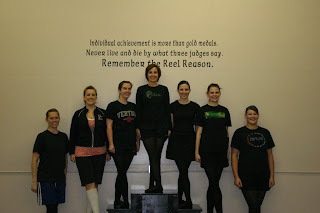 The next time you attend a Western Region feis, track down the Crawford School of Irish Dance’s adult team. 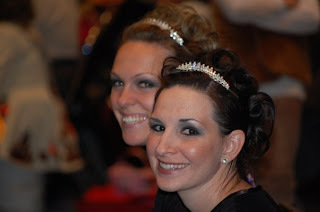 They are well aware of the hard work and challenges that come to adult Irish dancers, but the benefits and joy that they gain are evident in their dedication, their words, and, of course, their dancing.